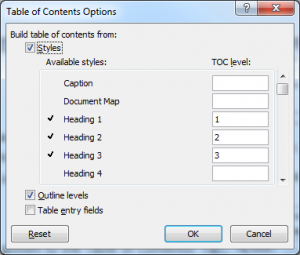 Translating in Word: Creating a Table of Contents | Language Solutions Inc.
Before translating a document that contains a lot of chapters, it’s always a good practice to make sure your Table of Contents (TOC) is set up correctly. Table of Contents that are manually created need to be manually updated in translation as well. This can be a time consuming task which incurs additional costs; especially when your text re-flows and you need to manually verify each heading and associated page number. Multiply that task by the number of languages you are translating into and you can see how this can become an expense that you can reduce on your end by doing some prep beforehand. Therefore, it is always recommended to set up your Table of Contents in English to automatically generate from heading styles. Here are some tips on how to set up a TOC. Heading Styles are what drive your TOC. Styles always require a bit of up-front investment but it’s worth the time. We use Styles a lot when we work in InDesign because once it is set up, we have the ability to make global modifications to text of the same style. You can do the same in Word by working with the Heading 1, 2, 3, etc. Styles that are already created by default. We suggest sticking with these default headings and update the format rather than creating new styles. You can pull up all available styles by using the ALT+O+S combination on your keyboard. Keep it handy for the rest of this tutorial. If you don’t like the Heading Styles that are created by default by Word (there are several style sets to choose from), you can easily update each Heading Style to match the format you have defined in your document. Simply format your headings, then select the text of your heading, right click on the style that you want to associate it with and click Update the Heading Style to Match Selection. Do that for each of the Heading Styles (Heading 1, Heading 2, Heading 3, etc.) you want to define and then start applying the styles throughout the rest of your document. 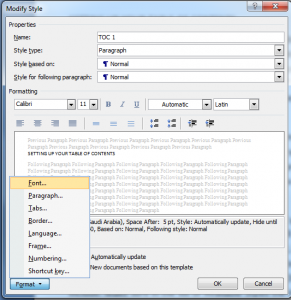 Once each heading in your document is applied to a particular style, you can Modify each style and it will apply to all of those headings in your document. Headings can be automatically numbered using a Multilevel List (found under the paragraph group in Home). The problem with this option is that you either have to manually select every Heading in your document or apply the Multilevel List to each individual Heading Style separately. The easiest way to do this is the second option. To update each Heading Style with a number format, start with selecting text that has Heading 1 applied to it. Choose Multilevel List (see red circle) and then Define a New Multilevel List. Here you can associate each level with the appropriate heading style. Set the appropriate connection between the level and heading style (associate the right level (numbered 1, 2, 3…) with the style on the right hand side (1 with Heading 1, 2 with Heading 2, etc.). Then modify your format to meet your needs. Once you have set up your format for level 1 for Heading 1, confirm by clicking OK and then update Heading 1 style. You’ll see that your text now has a number in front of it. 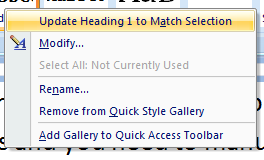 Simply use that Heading to update the Heading 1 Style using the same method as before (right click on the style and Update the Heading Style to Match Selection). This should automatically change all of your headings associated with Heading 1. You repeat this method for each subsequent style. Select text that has a Heading 2 style and follow the same steps, but make sure you choose level 2 this time and associate it with Heading 2. Update the style with your selection. Do this once for all Heading styles you have in your document and you should have your headings automatically numbered. All this work and we have not even gotten to the Table of Contents! Table of Contents can be found in the References tab in Word. However, before you set up your table of contents, be aware that once you have set up the TOC to include certain heading styles, it’s generally ” locked-in”. If you want to for instance include Heading 3 at a later time, our advice is to insert a new TOC. So choose your setup wisely. When inserting a TOC, there are many format options possible. Don’t go for any of the pre-formatted TOCs as it doesn’t give you much control over what is included. In a customized TOC format, you can select how many levels are shown and in advanced options, you can map each style to a TOC level. If you want to exclude specific chapters in your TOC, you can leave out any heading style. If you want to be more specific about particular headings you wish to exclude, you’ll need to define a separate style for those headings. For instance, say you don’t want to include Chapter 9.1.1 – 9.1.12, but you do want to show Chapter 8.1.1 and 8.1.2. Both are normally a Heading 3 style. You can select the text for Heading 9.1.1 and create a new style (Save Selection to a New Quick Style). Call it something like Heading 3 – NO TOC. Then, apply that to the Heading 3 styles you do not want to include. Make sure in the list of Available Styles the Heading 3 – NO TOC is not mapped. Finally, your Table of Contents may not look the way you want. Word deals with TOC styles separately from the Heading Styles and calls these by default TOC 1, TOC 2, etc. You do have the ability to change any of these styles to your liking, including things like fonts, indentation and paragraph spacing. If you want your TOC to have titles in ALL CAPS you can simply apply the font style ALL CAPS to TOC styles without affecting the actual headings in the document. Updating TOC styles can be done the same way as regular styles. You can modify text that has the TOC style applied and update it when you have made your modifications. Any text with similar TOC style will be updated to match the new format. If you plan to create a lot of documents using the same styles, consider setting up a template in Word that has all styles defined. You can save the current style set to be the default set for any new document created. 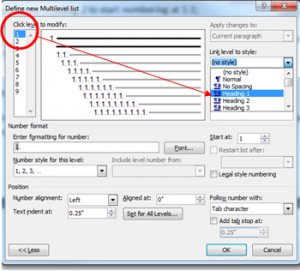 In bidding out translation jobs, consider the time it takes to set up a job in Word correctly. Consider the option of having your Language Service Provider as a partner to help in setting up documents for translation against the investment of time needed to set it up yourself. 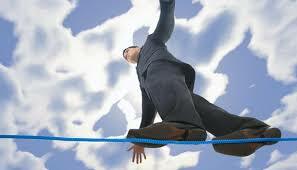 Consider a Language Service Provider that also has the skill to do so. If you plan on creating bilingual documents using styles, stay tuned as it requires some attention. We’ll blog about that soon! Should you use free web fonts for translated websites?